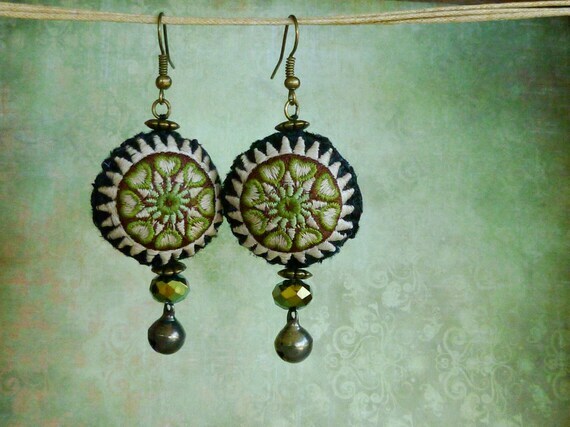 These earrings began with little pillows from Thailand made with vintage tribal Hmong embroidered fabric. 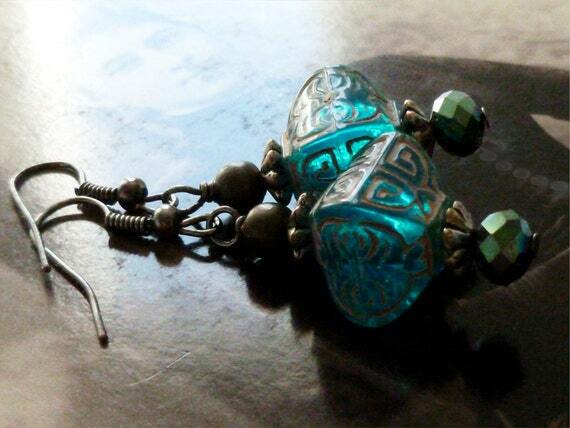 I embellished them with blue glass beads, large vintage metal bicone beads, and other brass and metal beads. The textile pillows are made from vintage tribal Hmong embroidered fabric. 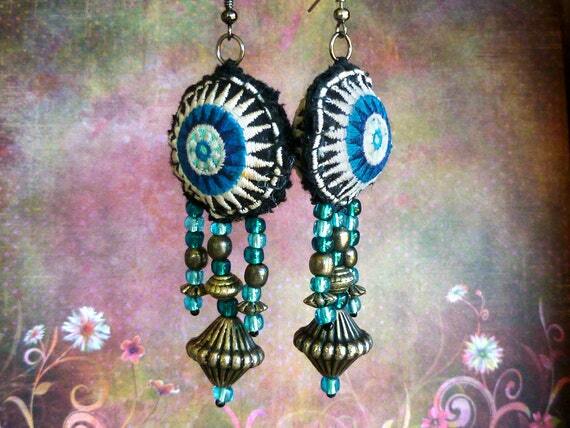 I embellished them with a faceted mirrored bead and a little oxy silver plated bell. 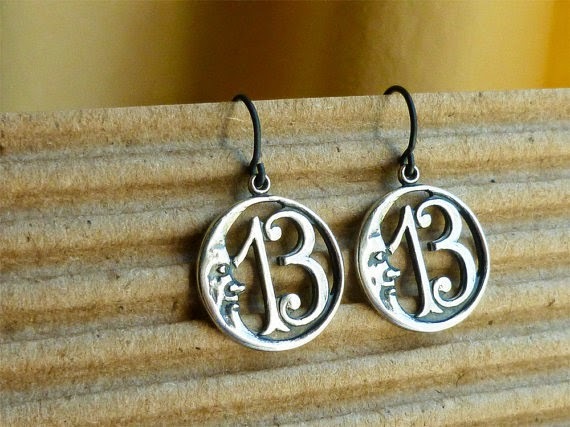 If 13 is your lucky - or favorite - number, these charming earrings are just for you! The silver plated brass medallions are 11/16" in diameter, which is a shade smaller than a penny. Their shine and the oxidized finish makes them really stand out! The ear wires are niobium, which is one of the most naturally hypo-allergenic metals known to man (and woman!) They have an anodized black finish. It all started with black cotton cord, which I crocheted with colorful glass beads throughout. 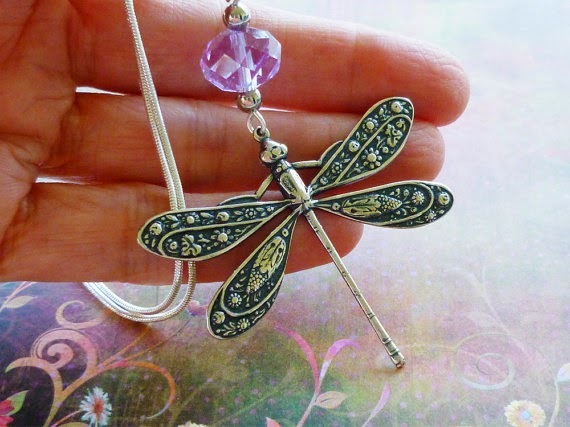 Then I thought how lovely the brass dragonfly would look with this - like it was in a moonlit garden! The connector adds a touch of sparkle and wow. It features a large faceted pink glass bead and two smaller blue faceted bicone beads with antique bronze finished brass spacer beads. I've only made one of these, so if you like it, and it's still available, buy it before someone else does! I'm not likely to make more. 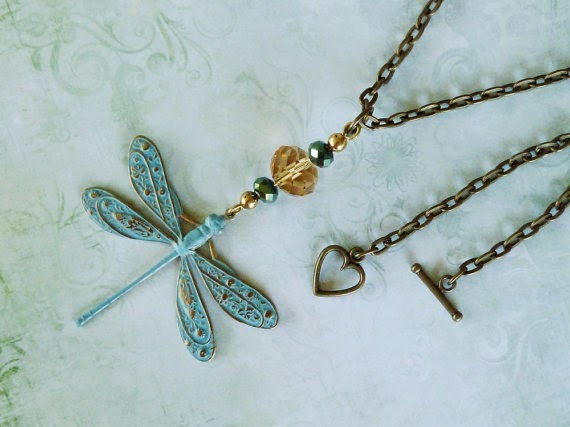 This is a very sweet - but not too delicate looking - necklace I designed and created. 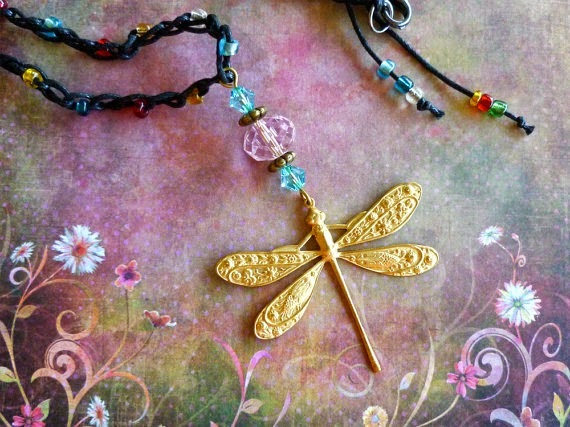 The dragonfly is a solid brass stamping I hand painted with a special craft paint which is made for metal, then buffed off the highlights to let some of the brass relief design show. The beaded segment features a large faceted amber glass bead, smaller mirrored faceted green glass beads, and even smaller round solid brass beads. 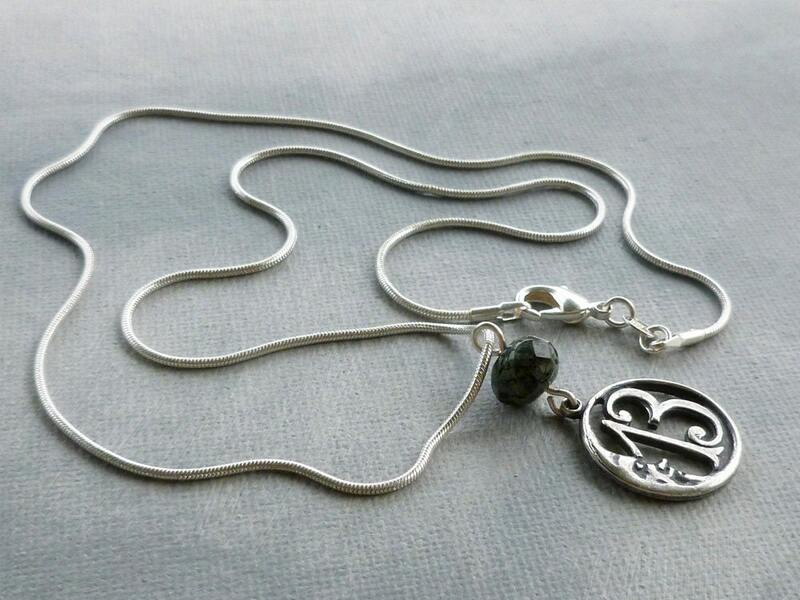 The neck chain is 18" long, and has a charming heart clasp. What a lovely and unique gift for a 13th birthday, or for anyone whose lucky number is 13. *Use at your own discretion for children under 14. Materials are sterling silver (necklace), silver plate (medallion), silver plate wire (sterling over copper, coated), and glass (bead). Both earrings have a vintage metal flower dangling at the bottom. 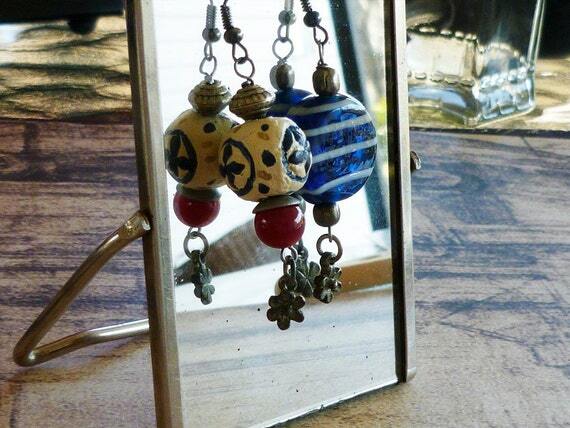 These artsy earrings measure 2 1/2" from the top of the ear wire.